The maples here have all dropped their leaves and I've been busy raking them up. But the oaks still hold onto most of theirs for a few more weeks keeping the landscape alive with their russet colors. 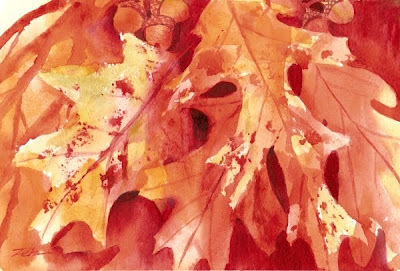 This is called a "medley of oak leaves" because I've painted different varieties of oaks. That's how they appear on my lawn - a mixed bunch! I've added some acorns as well!